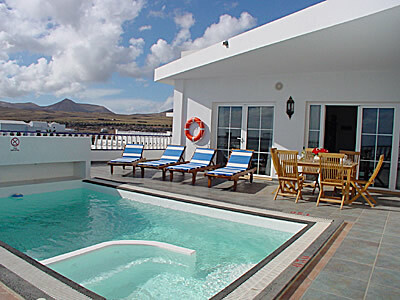 Villas Ella are a selection of villa situated in Puerto Calero, just 10 minutes walk from the international marina, with its selection of restaurants, cafes and bars. These villas have three bedrooms and 2 bathrooms. They are beautifully decorated with Canarian style furniture. Outside the villa has a solar heated pool surrounded by a sun terrace furnished with sun loungers and patio furniture. The living area is spacious and has patio doors which open out to the terrace. The master bedroom has a king-size double bed with ensuite bathroom and also has a patio door leading out to the terrace. These villas are not suitable for anyone with walking difficulties are some of the villas are on an upper floor and accessed via steps.